Thank you for your submission, A RECREATION DEMAND MODEL OF THE NORTH CAROLINA FOR-HIRE FISHERY. The following URL links to the abstract page for this submission in the SSRN eLibrary. If the full-text paper is included with your submission, you can also download a copy of your paper from this web page. This is a short, simple paper but I like the model and results. We have two measures of cost per trip: travel cost and the charter fee. For those anglers who travel for the (self-reported) primary purpose of a charter fishing trip, the effect of each type of cost on the location decision is the same so that the cost per trip is the sum of travel costs and charter fees. For those anglers who enjoy a day of charter fishing as a secondary purpose of taking the trip, travel costs and charter fees have different effects on the location decision. 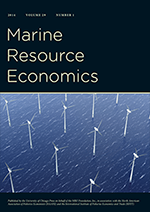 In this paper we measure the recreational economic benefits of the for-hire recreational fishery in the coastal region of North Carolina. We estimate a single trip random utility model for primary purpose and secondary purpose anglers with data from a field survey of charter and head-boat passengers. We find that primary and secondary purpose anglers exhibit significantly different behavior with regards to cost. However, once costs are weighted for secondary purpose anglers the value of catch is not statistically different across groups. For primary purpose anglers, the willingness to pay per trip is between $1800 and $2000 for one additional billfish (per angler), between $55 and $65 for one additional coastal migratory pelagic fish, $39 for one additional mackerel, and the willingness to pay per trip for an additional snapper-grouper is between $61 and $94. The net economic value for a charter boat trip averages $624 per angler per trip, and net economic value for a head boat trip is $102 per angler per trip. *Our RePEc coordinator is attending the EAERE meetings (and it looks like the presentation is today) so I'm relying on Craig Landry to do the dirty work at SSRN.